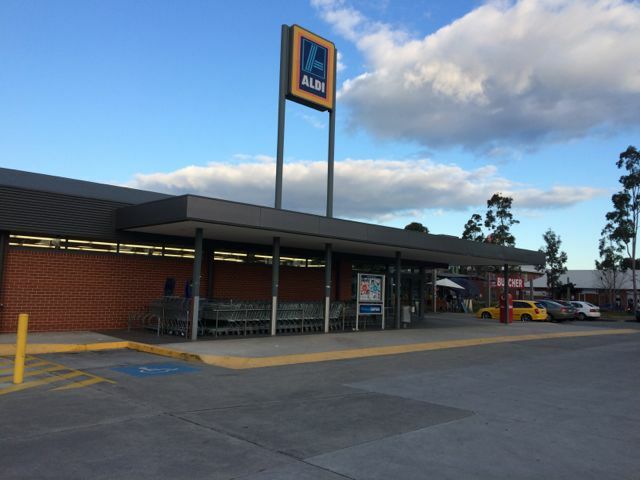 Ample car parking is available directly outside the supermarket. About one third of the car park is covered in shade cloth. The trolley bay is just outside the supermarket and is sheltered with a roof. Trolleys are secured and require a coin or token to use. The entry is via an ‘in’ door with a double door system. It prevents shoppers from exiting without going past the cash registers. An alarm sounds if someone tries to exit through the in door. Like most supermarkets the lighting is very bright and the temperature is moderate. The aisles are wide enough for two trolleys to pass. In some areas shoppers have to wait before they can pass another shopper or get to a particular item. Facial expressions on some shoppers indicate patience or impatience. Some shoppers excuse themselves so they can reach an item near another shopper. Announcements requesting a staff member or announcing the opening or closing of a register can be heard. Shoppers in pairs or groups talk to each other. Children make most of the louder noises or sometimes a parent disciplining a child. Most items are contained in boxes or on pallets that serve as shelves. Large wire containers hold clothing and household items in the centre of the store. These containers range from organised to messy. Some shoppers sift through items contained within, while others ignore them and pass by quickly. Electronic goods and items of higher cost than grocery items are enclosed in a glass display case so a staff member must assist with their retrieval. Prices are displayed above all items with bold black text on yellow or red tickets. The red tickets distinguish items that have a special price or that are available for a limited time. Signage hangs from the ceiling for promotion. The cash registers have a long conveyor belt where customers place their goods and they use dividers to separate their goods from those of the next customer.There are many small items above the conveyor belt. Staff at the registers scan the items very quickly. There is only a small bench to place goods on once they are scanned. Customers need to be quick at retrieving their goods from the staff member. Customers load their goods into their own shopping bags or trolley. Some struggle to keep up to the pace of the staff member on the register and have trouble getting their money or card ready to pay while packing their bag or trolley. The EFTPOS/credit card keypad faces the customer and the staff member provides verbal instructions and only assists if the customer is unable to follow the verbal instructions. Customers who are slow at paying and packing their goods are sometimes pressured to hurry along by the body language of the next customer in the queue or by the speed of the staff member at the register. About three steps from the register there is a long bench that provides a space for customers to organise and pack their shopping into bags. For a selection of images visit my Flickr album. Images have also been added to the INF536 Flickr group. 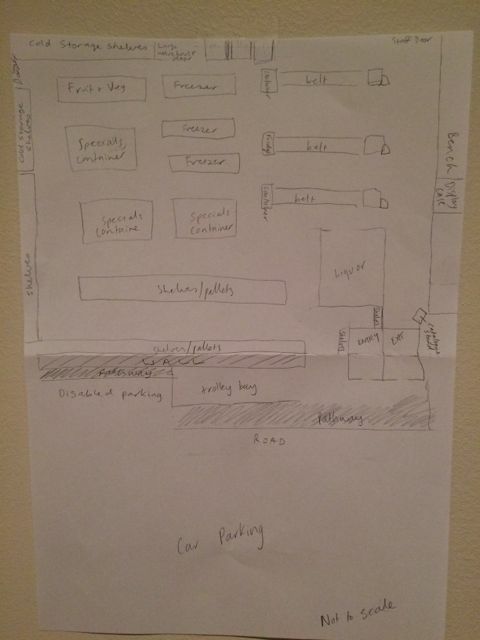 Sketch of Aldi floorplan. Not to scale.